FIU’s first-ever faculty and staff fundraising campaign, “Ignite,” has raised more than $2 million in five months. “Together we are igniting dreams, creativity, discovery and innovation for the thousands of current and future students of this great university,” says President Mark B. Rosenberg. The Honors College, the Department of Dietetics and Nutrition, External Relations and University Advancement have led the way with 100 percent participation. Honors College Dean Lesley Northup matched her staff’s contribution up to $2,500 — in addition to her own pledge. College of Nursing and Health Sciences Dean Ora Strickland will also match up to $5,000 each year. The success of the campaign can already be seen in programs throughout the university. The Honors College recently received a grant from the Miami Foundation for their Sweetwater Partnership and a six-figure gift from alumnus Norman Uriate’s Panorama Travel. Dean Northup says these gifts have substantially increased the college’s ability to provide scholarship assistance to students studying abroad and participating in engagement activities. Part of FIU’s larger $750 million fundraising campaign led by University Advancement, Ignite encourages employees to donate to the area of the university they care about most. More than 29 percent of FIU’s employees have already given. Of those, 12 percent are part of the Leadership Circle, indicating that they had made a five-year pledge to FIU. A significant gift by Dean Emeritus and Professor Lillian Lodge Kopenhaver will establish the Lillian Lodge Kopenhaver Center for the Advancement of Women in Communications. The charitable investment will position the center as a pioneering site for the advancement of women in the field of communications as well as support a new generation of female students by preparing them for leadership positions. Provost and Executive Vice President Douglas Wartzok and his wife Sue, who is a university librarian, contributed to the Amernet String Quartet in the School of Music. The gift will help with operating expenses of the quartet as well as help support the School’s chamber music program. The contribution of Assistant Director of the Division of Research Operations Mercedes Rodriguez, who has been at FIU since 2001, will help fund research. As a single mother, Rodriguez says she is grateful for the opportunity FIU has afforded her. Her son graduated from FIU with a bachelor’s in business administration and she earned her master’s in 2008. Rodriguez also gave a gift for the Berta D. Villares Book Scholarship Award in honor of the former associate director benefits. The scholarship award provides faculty and staff members using the FIU tuition waiver a one-time cash award. The award is designed to help offset the expenses associated with the purchase of required course textbooks. Tyler Groll, a coordinator in the Department of Student Conduct and Conflict Resolution, spent his graduate career in the stacks of the Green Library. He says he gave to the library because it serves as a symbol for knowledge and untapped resources that stay with the university long after students and faculty leave. To make a contribution and view the many ways in which you can help FIU be Worlds Ahead, visit the Ignite website. Proud to be a part of this great achievement our first year! 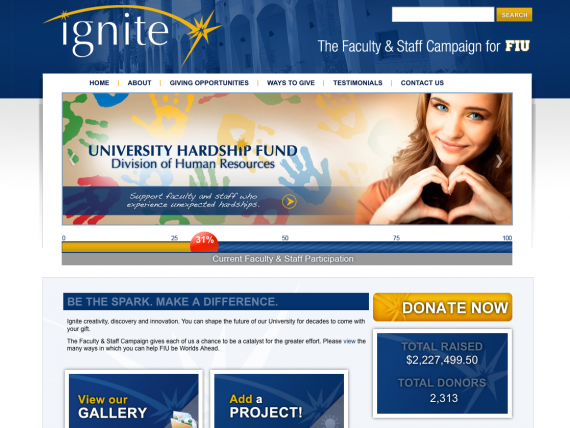 Thanks to everyone who has been so supportive of the FIU Ignite Faculty & Staff Campaign!